Run Nova Scotia has a Road Race and a Timex Race Series. Runners accumulate points and can win prizes in their age category. I’m holding my own similar Pregnancy Race Series where I accumulate race results and can win my personal contest to stay fit as long as possible. I’m hoping that this series will carry me to the start line of this spring’s Blue Nose 5km. This race is really important to me because I will be participating again this year as part of Team Love4Gambia (I hope you will too. Registration in February. Pregnancy optional). As a runner, I’ve always been pretty lucky that my body does what I ask of it, be it 85km weeks, full marathons, or running expeditions across African nations. I’m feeling really lucky that 16 weeks into my pregnancy, my body is still doing what I ask of it. Although luck, the chance happening of fortunate or adverse events, likely isn’t the right word. I’ve arrived at this point through a lot of hard work, determination and intelligent training. The SMU track is best place in the city for a pregnant runner to run because there are still 5 porta-potties on the track for the SMU football season. My bladder is sharing its once roomy location with a new tenant. Proximity to a bathroom is excellent. I’m growing out of more than just my clothes. I left my hydration belt in The Gambia with Kebba because he loved his “grenade-belt” and you can’t buy them there. I did a few long runs with McKim of 12+km and it’s now too long for me to run without water. I pulled out the hydration pack that I used in The Gambia, intending to fill it up and hit the road with McKim. Husband caught me in the kitchen and forbade this, lest I poison our unborn child with the West African microbial bodies that have likely taken up residence in the fluid bladder. So I went shopping for a new fuel belt only to realize that my normal size fuel belt no longer fits around my waist. I’ve learned that I can still race. 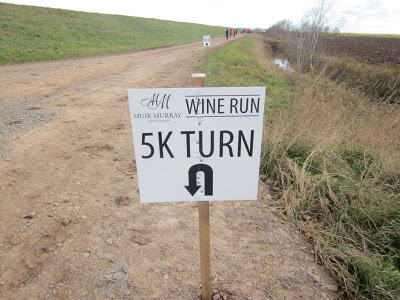 This past weekend was the Muir Murray Bacchas Wine Run in the Valley. Yes, this means that it was a race at a winery where there is red wine at the water stops. My friend Candice asked me to do this race with her before we announced our pregnancy so I agreed, secretly knowing that it would be a no-wine Wine Run for me. We signed up for 10km. I was excited for Saturday because I am still feeling really good while running. I’m still easily hitting my “pregnancy-threshold” pace of 4:40/km on the track. I have gained 6lbs, not enough to feel heavier. I was ready to race! Although my girls and I weren’t so smart executing the start of our race. The Wine Run had about 400 runners last year and the field grew to 1000 this year. While the volunteers put on a great event, they weren’t totally ready for such a big increase in numbers. Ten minutes before the planned 10:00am start, about 300 runners were still waiting in line to get their bibs. Another 100 were waiting in line for the bathroom with us. We figured that there was no way this race would start on time. Mel, Candice and I had just finished putting our warm clothes on at my car at 10am. To our great surprise, the gun went off. Instinctively, we started running to the start line. We noticed that none of the 300 people around us had reacted to the gun. We decided that this must have been a warning sound, asking runners to line up. While chatting with some friends, we made our way to the start without much hurry. We got to the start at 10:05 and realized that the race had indeed begun. Opps! Now about 500 runners were in front of me, cramping my plan to run well. Although this was a fun run with no timing clock and no race results. Off we went. It took me about 2km and 11:20 to shake most of 500 runners and find a place where I could run at my own pace. I loved this race. The course takes you through the Grand Pre Dykes. With a steady stream of runners against the Minas Basin and Blomidon, the view was spectacular. It was fun waving to many running friends on the course. As I was not drinking wine, I was through the water stops much quicker than everyone else. For most of my run, I was thinking about how happy I was to be running. Aside from being scenically stunning, the Dykes are pretty flat. Baby Poirier hates running up hills. It’s weirdest thing. I’m not tired. I’m not out of breath. My legs don’t hurt. But when I arrive at a hill, my body tries to put the brakes on forward motion. The run ended on a 300m hill. I was determined to run up without walking. You don’t walk 300m in front of a finish line. My forward motion up this hill could barely be classified as running. But I was not walking! Not counting the 11+ minutes it took me to run the first 2km in a crowd of 500 runners and walkers, I ran this second race in my pregnancy series at 4:51/km (including my half run/half walk up the last hill). 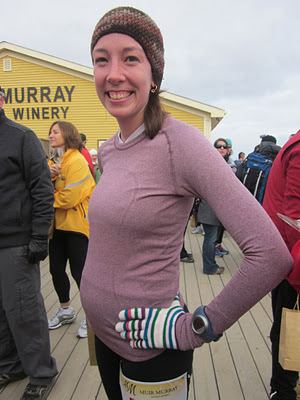 The first race in my pregnancy series was my 9.4km leg at Rum Runners Relay, where I ran at a pace of 4:50/km. This is interesting Pregnancy Race Series data (Garmin date here). I have not slowed much over the last 6 weeks. Pregnancy Race Series #3 is a 10km with Heart and Sole Running Club at 20 weeks. Stay tuned! Next week we are signing Baby Poirier up for university. The week after that, we are signing him/her up for the New York City Marathon Lottery. This entry was posted in Running during pregnancy and tagged garmin, Muir Murray Winery, pregnancy, race, Wine Run. Bookmark the permalink. So Baby Poirier does actually have some of Greg’s DNA..it doesn’t want to put effort into running up hills!! !